DPVs is a great way to maximize your exploration of the underwater world in a limited amount of time. 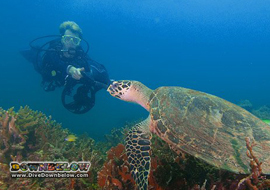 At Downbelow’s PADI 5 Star IDC Dive Centre on Gaya Island in Kota Kinabalu, we’ll introduce you to scooting through the water without kicking with the assistance of the very popular Dive Propulsion Vehicle. The DPV Speciality Course will teach you the ins and outs of using the Diver Propulsion Vehicle, the special considerations and operating procedures. Whether you’re making a shore dive or diving from a boat, a DPV is a great way to see more and have a blast doing it. All our courses take place at our on Gaya Island, so you are not stuck in the classroom or boat for the day – learn in Paradise! DPVs are very handy when wreck diving, especially the large, WWII Usukan Bay Wrecks that Downbelow likes to visit. 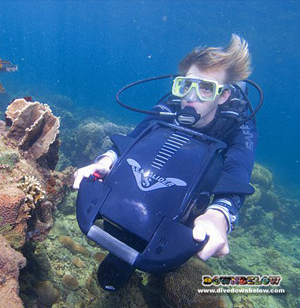 The Diver Propulsion Vehicle Speciality Course in Kota Kinabalu will allow you to tour more of the wreck, while using less air. It’s also a great idea to combine the Dive Propulsion Vehicle Speciality Course with the Wreck Diver Speciality while you’re at it. Once qualified guests can rent our DPV for leisure diving from our PADI 5 Star Dive Centre to explore the reefs of the TAR Park. For more information on completing the PADI Diver Propulsion Vehicle Speciality Course please contact us to book your place on the course.